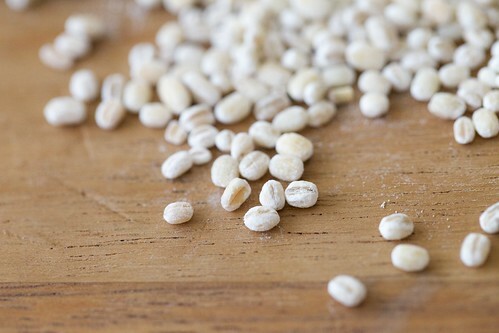 I’m totally in love with barley and lately it has entered my list of favourite grains. It’s chewy texture, nutty flavour and excellent taste have won me over. And it only helps that it is loaded with healthful properties. I have been cooking soups, stews and even including it in my khichadi (a wholesome one pot meal with rice or , lentils and vegetables). I’m not into typical soup recipes for a few reasons. I like to use fresh ingredients and somehow stocks (not easily available here) and seasoning cubes don’t fascinate me. Neither do I have the inclination at this point in time to make my own stock which could be rather time consuming but maybe well worth it. Someday I would give it a go, but it is not practical to incorporate it into daily cooking. Now, it so happens that we do love a bowl of good soup, especially with warm toasted and herbed breads.This means that I have to hunt for or create recipes incorporating my inclinations and inhibitions. This is one such recipe that wins. It is wholesome, nutritious, comforting and tasty. 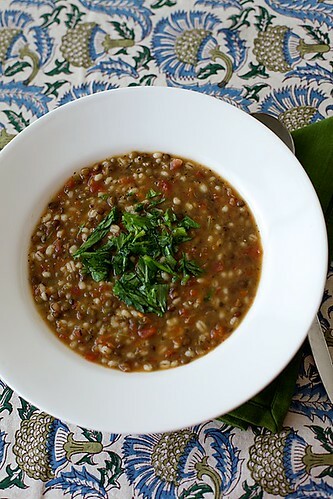 The protein from the lentils, the carbohydrates and other essential nutrients from the barley and the vitamins from the vegetables make this a complete meal. One spice that needs an honourable mention here is asafetida. Add a good pinch to smoking hot oil and its garlicky flavour fills the kitchen. It is great in taste and one of my most used spices. Asafetida does a fantastic job in the soup here and helps to digest the lentils which can be a little heavy on the system. I also need to mention my love for celery. This is one of those recipes where you use both the ribs and the leaves and nothing goes waste. 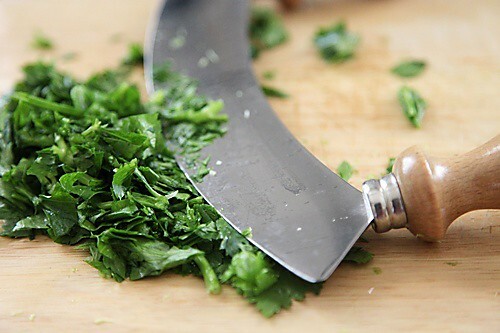 When I chop the leaves with my mezzaluna, the aroma arising from the innards of the celery leaves entices me and I’m in heaven. This soup is quick to make if you use a pressure cooker. So, if you want a healthy, tasty and quick one pot meal kind of a recipe then this is it. My little toddler who is quite particular in his tastes relishes this soup so I’m guessing its a good recipe for children too. Perfect for those week days when you are tired and don’t feel like slaving in the kitchen and yet crave a good meal or a have a family to feed. Pair it with bread made this way and you have a great meal on hand! 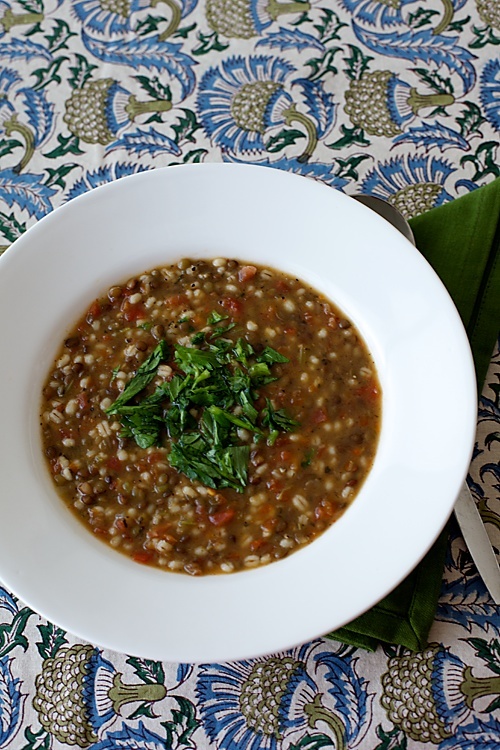 You could experiment with other lentils here but make sure you use pearl barley as barley can be difficult to cook and eat. Soak the lentils and the barley overnight or for 2 to 4 hours. In a pressure cooker or saucepan, heat the oil , lower the flame and put in the asafetida. Stir for a few seconds until it releases aroma and then add the carrots and celery ribs and saute for a few seconds. Drain and put in the lentils and barley, oregano, parsley, cumin powder, red chilli powder, pepper, and water and bring to a boil. Add in the salt, cover the lid and pressure cook until 3 or 4 whistles. 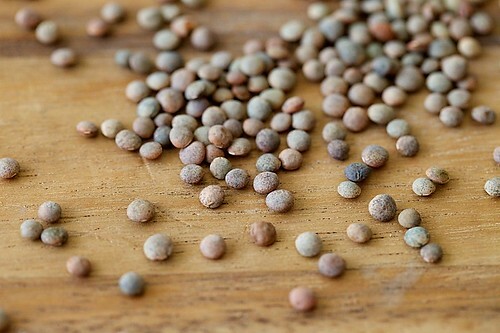 If using a saucepan or a pot, cover and cook, stirring occassionally until the lentils and barley are cooked, about an hour or so. Adjust the water and salt consistency to your liking, garnish with celery leaves and serve hot. In the oil free version, I put in all the ingredients minus the oil and cook till done. 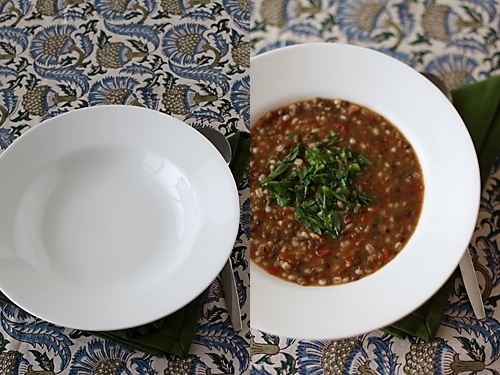 Hey, Anu..I just now posted 3 recipes of Barley on my post!! Looks like we are having intuitions about this grain 🙂 Now I need to make this 4th recipe too. Perfect and my kind of healthy soup. 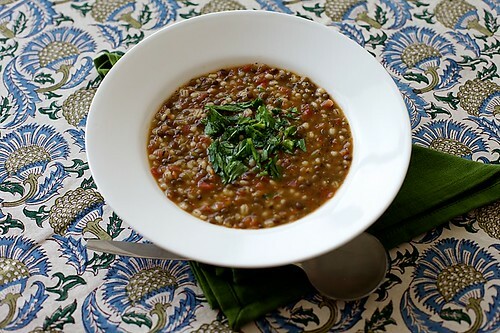 And the black Lentils natch perfectly for more fibers and extra punch of nutrients. Looks hearty and healthy. Autumn has begun in Australia and this soup would be perfect .. all brown and rustic! I love barely soup but never tried with Masoor dhal though.. looks so yumm and very hearty and comforting meal. The soup looks so comforting and delectable. Wholesome in every way!!! I love barley and lentil soups. This combination looks awesome. I presume the ingredient listed as 6 cups is water. Right? I love both barley and lentils. I may make this recipe tonight. It looks great! Made this today. Tasted barley for the first time. It did not taste good. I had to discard the whole thing. May be the chewy consistency threw me off. Arthy: Are you sure you cooked the barley well? Its mild chewiness is exactly what I love about it! If you like it, barley is an excellent healthful grain! Is there tomatoes in the bowl in the picture? It really looks as if there is. maylynn: There are no tomatoes in this recipe. What you see are the carrots. Adding something to the picture of the recipe which does not include the ingredient is against my philosophy. I tried this a few weeks ago with some success but didn't have asafoetida and forgot to put in salt! So it was a little bland. I tried substituting turmeric but it didn't quite do the trick. My husband and I both liked it well enough anyway though so with all the right ingredients who knows…..! Am wondering though in the directions where you say: "Drain and put in the lentils and barley…." I think I must be missing a step. Is something supposed to be soaking? I just threw everything else in at that point and simmered it for a while which also seemed to work but if a better approach is to soak stuff I'd try that if you could explain further. Kristin: Thank you for your note. The lentils and the barley have to be soaked overnight or for a few hours before cooking. I don't know how I missed that step. Thanks once again for letting me know. Turmeric in this soup is not a very good idea, according to me. I hope you like this soup when you try it with all the given ingredients. Prepared this last night for a family get-together and they aboslutely loved it. All your hard work is worth it when you see your family enjoying what you've fixed for them. Thanks for the wonderful recipe.